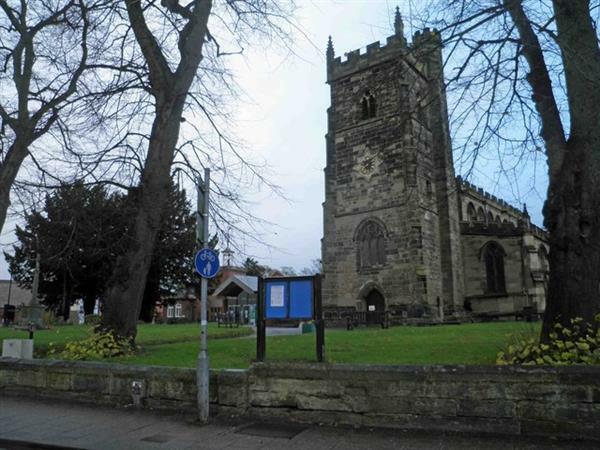 The venue for tonight's hustings is the lovely town of Nuneaton. Nuneaton is a swing seat and is symbolic for Labour because it's declaration for the Tories on election night made it clear that the party had done a lot worse nationally than it had hoped. The venue itself is St Nicholas Church. 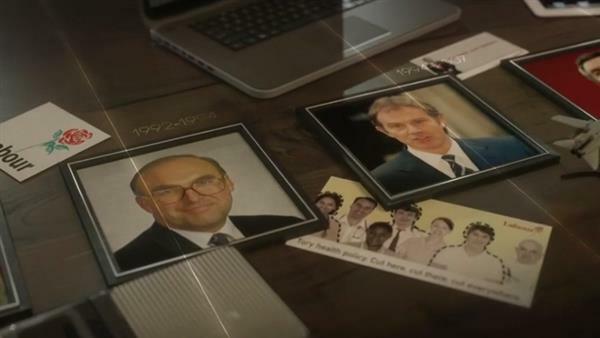 The hustings tonight will be chaired by Newsnight's Laura Kuenssberg. She'll be taking choosing audience members to ask questions. #labourdebate at 7pm Tonite - before then Osborne at despatch box for PMQs - could he be the man labour winner faces in 2020? Over at Indy Voices we've got a couple of takes on the Labour leadership contest so far for you to get stuck into. Commentator Simon Kellner reckons that "you may disagree with him, but Jeremy Corbyn has a key role in Labour's leadership race". One of the awkward things about a mature, functioning democracy is that you don’t always get the result that you wanted. Meanwhile Sedgefield Labour MP Phil Wilson says that "If Tony Blair were leader of the Labour Party today, he wouldn’t be a Blairite". Our once winning formula needs to be unpicked and refined because, even though our main opponent remains the Conservative Party, the equation has become more complicated. The nominations for the Deputy Leader position - which is also vacant - also closed today. Campaigning MP for Walthamstow Stella Creasy got in by a whisker. Looking forward to debates with @CarolineFlintMP @tom_watson @angelaeagle & @BenPBradshaw how best 2 change labour so we can change Britain! You can read our full write-up HERE. Before the hustings starts in five minutes, let's re-cap where the race is now. 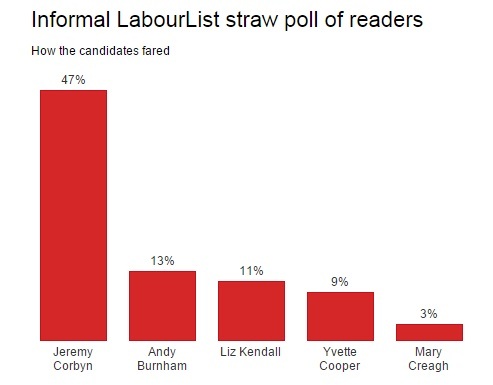 Take this poll with a pinch of salt, but LabourList reckons Jeremy Corbyn is ahead with its readers. It'll be interesting to see how the audience receives the candidates tonight. Hopefully we'll have some kind of metric - even a show of hands. Laura Kuenssberg is introducing the candidates - here they are! "I'll be a leader whose voice can carry to all the nations and regions of this country. I'll change Labour too ... I know we lost your trust on the economy, on immigration ... I will be a leader that makes sure we'll need no one behind, and the leader..."
I think that over the years we've lost our way. We've become cowed by powerful commercial interests, we've become frightened for the press. I want a more equal society, a fairer society, I want a Labour party that is at the heart of the community demand jobs, homes and hopes ... we're moving in the wrong direction at the present time, let's turn it the othe way. First question - how do we get away from the legacy of Tony Blair and rebuild a left-wing Labour party? Andy Burnham is up first: a difficult one for him. He says he doesn't want to rebuilt a left-wing Labour party. He says "I don't think we' d want to do that". He adds that Blair "didn't get everything right" but actually got much right. Liz Kendall next "I'm not Blairite, Brownite, Old Labour, New Labour, I want to be tomorrow's Labour" she says Labour needs to "apply our values to the future". "Like Andy I'm very proud of the things we've achieved but the world has moved on and we need to move on." Yvette Cooper says in response to Kendall's line about a "fresh start" that there's "an advantage to experience and I make no apology to having run a £100bn department" and says she rolled out SureStart and voted for the minimum wage. "In the end this can't be about taking a narrow party and moving it to the left and moving it to the right. We've got to grow, build ... anybody who thinks that there's some playbook from the past [it's wrong]." She said she didn't have baggage - and Laura asked whether she meant others didn't have baggage. Surprised Liz fell into the very obvious baggage trap there. Jeremy Corbyn responding to the question "I've never considered myself a part of New Labour". He says the biggest problems of Tony Blair were reducing democracy, the "promotion of markets rather than a planned economy". He's also angry about how close Blair got to the US and George Bush. What would he do differently, though? "The party has an opportunity now to rediscover its principle roots ... the issues of public service, the promotion of coujncil housing. But if we're going to say this policy needs changing a little bit, the Tories will do this, we'll do this, it doesn't work. "People are looking for that real fundamental change in our society." Corbyn is getting the loudest claps from the audience. I opposed the Iraq war. But come on, talking about it is NOT going to illuminate a Labour leadership campaign in 2015. The candidates have been asked about what they'd do on immigration. Yvette Cooper says she doesn't want to escalate the rhetoric on immigration. She fudges a question about whether people should be able to claim tax credits. Liz Kendall asked whether she'd take tax credits "away from immigrants". She responds simply "yes". She says people should "respect the community you live in and our culture". She also calls for "honesty" and says immigration has "huge benefits". Andy Burnham says the UK wouldn't have an NHS "if we didn't have a health service that employs people around the world ... my own dad worked abroad when I was young, so how hypocritical would it be for me to say that I didn't support freedom of movement?" But he says there aren't only positives to immigration. Jeremy Corbyn is up and says the UK would be in a much more difficult position if there was no immigration. "I think Jamaican nurses and others that came here in the 1960s have done a fantastic job." Corbyn again getting most applause from this audience. An audience member asks what the next Labour leader would have in common with Nicola Sturgeon. Definitely advantage for two of the four candidates in this question. Jeremy Corbyn has an interesting answer about what he has in common with Nicola Sturgeon - he says he shared platforms with her about the Iraq War. "I absolutely agreed with her and she spoke brilliantly." Jeremy Corbyn is asked about #ToriesForCorbyn - he says "there are a lot of funny people on the internet". He concludes: "I think people have had enough about personality politics, they want movement politics." Laura Kuenssberg tells Corbyn he "borrowed" nominations from other candidates - not strictly true, as Corbyn explicitly said he didn't want to borrow any. A sceptical audience member says he hasn't heard anything new from any of the candidates. New question: is the budget surplus the most important economic objective? Jeremy Corbyn says: "No, no it isn't." "That comes over and above a budget surplus over a specific time. Reflate the economy over a longer period rather than this monetarist idea that you've got to balance the books in five years." I believe in strong public finances because unless we balance the books, get the deficit down, we can't do all the things that we're passionate about ... and we should back businesses! We should be supporting people who bust a gut and make money. It's now you bring the deficit and the debt down. We are too much a low-skill economy. "Hang on Andy," Kendall says - to sniggers from the audience, as he starts speaking. Sounds like people there haven't failed to notice his eagerness to speak. "No, a strong and growing economy is the most important thing. If you have this hardline approach to this where it's all coming from spending cuts, yes you might reduce the deficit but by god, we'll be left with devastated public services at the end of it." Yvette Cooper says a strong economy is more important than reducing debt, but that a strong economy sometimes means that the debt and the deficit should come down. She's keen to stressed that the financial crisis caused the deficit rather than the other way around. The hacks arguing Liz Kendall should be Labour leader also told anyone who'd listen that Jim Murphy was the answer in Scotland. A Conservative voter from the election asks "how are you going to change the sense of entitlements in some areas of the benefits culture". "Some people get an extraordinary amount of money but people like me don't quality," she asks. Yvette Cooper says "there's got to be clear rules" but says she would "never" refer to anyone as a a benefit scounger and talks about when she was unemployed. Jeremy Corbyn says a "benefit street mentality" is "deeply unpleasant". He talks about his local consituents "some have been through the most unbelievable horror stories" because of the "cruelty" of the benefits system. "I think we just need to look at the issue of eliminating poverty in society," he says. The next question is whether candidates would be open to resigning if they weren't doing well enough before the election. Liz Kendall says "yes" because "we cannot put our values into action unless we win". Jeremy Corbyn says "I think there should be an opportunity to elect or re-elect the Labour leader" every few years - "bring back democracy into the Labour movement," he says. Is it the BBC, or is he just good at getting applause? Andy Burnham says he'd resign as well. "The party comes first, always." Yvette Cooper isn't so keen about it being easier to kick out a leader. Is she thinking about the factional struggles of the Blair-Brown era? If I was a Tory, I'd be feeling pretty good about that. That's all from us tonight, folks. Thanks for reading.